SQL Server 2016 delivers unparalleled performance and security built-in for your most mission critical transactional systems and data warehouses, along with an integrated business intelligence and advanced analytics solution for building intelligent applications. Blazing-fast performance is key to ensuring you can deliver a flawless transactional experience while at the same time support demanding real-time operational analytics over the data as fast as the data is coming in. SQL Server 2016 owns the top TPC-E performance benchmarks4 for transaction processing, the top TPC-H performance benchmarks for data warehousing, and the top performance benchmarks with leading business applications. PROS Holdings uses SQL Server 2016’s superior performance and built-in R Service to deliver advanced analytics more than 100x faster than before, resulting in higher profits for their customers. KPMG, a leader in audit, tax, and advisory solution, posted 2.5x faster execution time with ten times the table compression with their solution using SQL Server 2016. Customers can also gain tremendous performance improvement by simply upgrading to SQL Server 2016 without application changes (e.g. queries will run up to 34x faster)5. 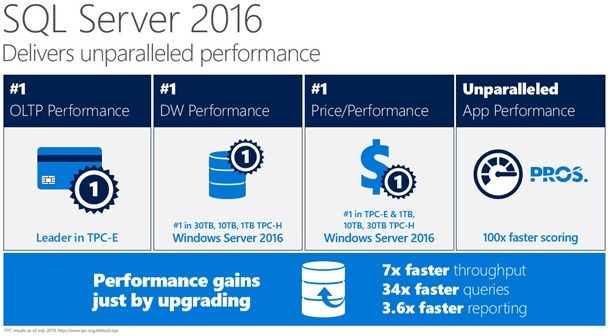 In addition to leading performance benchmarks, SQL Server 2016 also delivers top price/performance for both workloads providing customers with significantly reduced total cost of ownership. 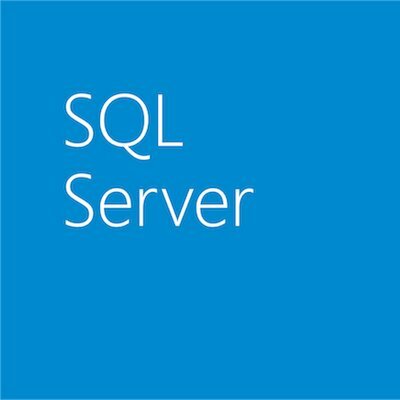 Easily experience SQL Server 2016 by creating a test environment using an Azure SQL VM. You can also experience the full features through the free developer edition (you will be prompted to sign in to Visual Studio Dev Essentials before you can download SQL Server 2016 Developer Edition). Visit SQL Server 2016 to learn more about new features and download the SQL Server 2016 e-book. 1Non-clustered TPC-H 10TB. https://lenovopress.com/lp0528-x3850-x6-tpch-10tb-benchmark-result-2016-07-11. http://www.tpc.org/3325. 2Non-clustered TPC-H 30 TB. https://lenovopress.com/lp0502-x3950-x6-tpch-30tb-benchmark-result-2016-05-02. http://www.tpc.org/3321. 3Learn more about how your organization can scale to handle the increasing amount of data being stored in modern data warehouses by reading the Intel whitepaper entitled “Accelerating Large-Scale Business Analytics,” which illustrates the integration of Microsoft SQL Server 2016 and Intel® Xeon® E7 platform driving advanced analytics on a large 100TB dataset. 5Based on internal tests from Microsoft, customers who upgrade to SQL Server 2016 will also experience tremendous performance gain including faster real-time analytics with up to 34x performance on in-memory columnstore queries, faster synchronization and greater availability with up to seven times faster AlwaysOn throughput, 3.6x faster reporting on AlwaysOn replicas and seven to ten times faster on database maintenance (DBCC).